1. Enemy health bars are brighter, and damage inflicted is yellow instead of orange. 2. Each segment of the player's health bar represents 200 HP (instead of 136 HP). An issue with the base game limits HP displayed to 1900, so this mod overlays a fade-to-black on the last 100 HP shown. 3. 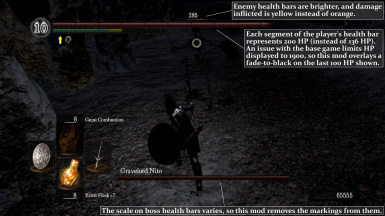 The scale on boss health bars varies, so this mod removes the markings from them. If you find any bugs or issues, please note them in the comments so I can promptly address them.